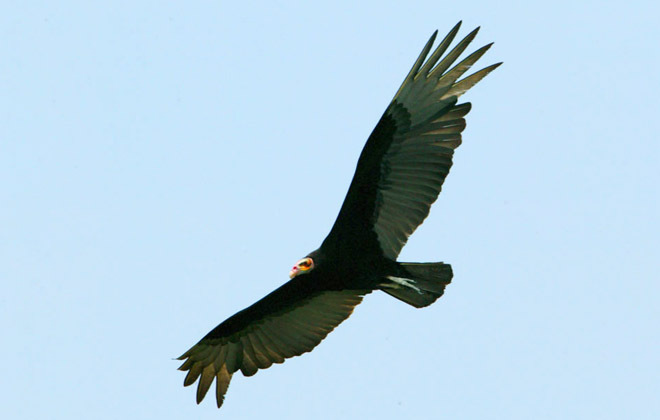 The Pantanal Wildlife Ride and Safari is operated on 3 different Fazendas. 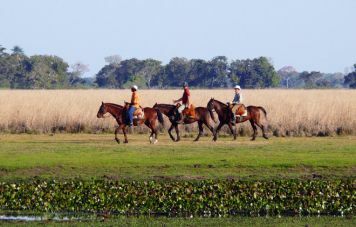 The ride starts at Fazenda Pouso Alto in the deepest Pantanal Savannah, continues at Fazenda Nhecolândia and ending at Fazenda Primavera. The distance from Pouso Alto to Nhecolândia is 35 km and from Nhecolândia to the Primavera 45 km. Fazenda the Portuguese name for a Farm or a Ranch. 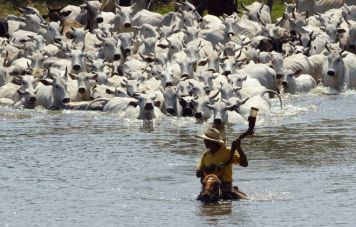 In the Pantanal it refers to cattle ranching. The ride is conducted on properties encompassing some 60,000 hectares or roughly 150,000 acres offering approximately 28,000 cattle grazing grounds. This ride was designed back in 1995 by Peter Rohmer for the genuine rider wanting a genuine experience, different from all other rides anywhere. 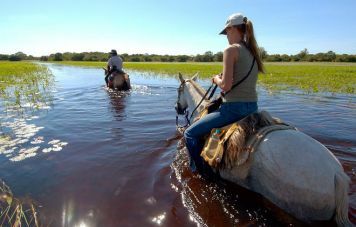 Peter´s priorities have been and still are to ride at places with no tourism at all or extremely little tourism to prevent loss of authenticity and tradition, as it has unfortunately become obvious at some places in the Pantanal. Another equally important requirement was that to make sure that the guests are getting involved with the owners and staff of the fazendas and are being treated as members of the family instead of tourist. 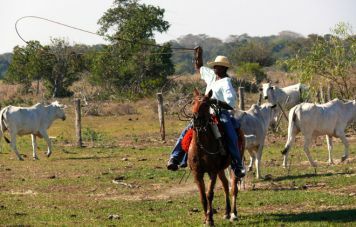 Our guests not only sit at the same table with the owners for meals or for chats but they also ride out with the vaqueiros, here called peões, to help them with their cattle work. An awesome experience and the dream of any rider. The quality of our horses is unquestionable, can be proofed and checked from our guests comments on our webpage. They are obedient, patient but also fast and forward going. We have horses matching with according to the rider's abilities and experiences. Pick-up at Campo Grande airport and transfer to the Hotel Vale Verde. After the long journey you have just completed the rest of the day is for your relax. 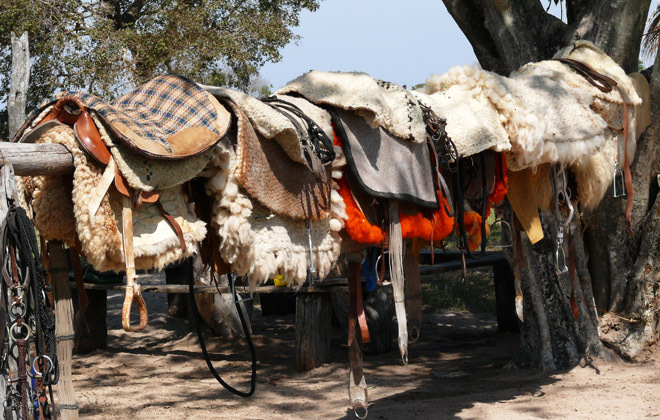 Depending on the time of your arrival however you may have some energy stored away to do some shopping of items you may need for your ride such as hats, boots, horse whip etc. There are specialized outfitters for ranch and horse equipment, which we recommend. Sun blockers and mosquito repellents are available in the pharmacy next to the hotel. The Vale Verde Hotel is located both close to the airport and to the Federal highways which you need to take on your transfer to the Fazenda Pouso Alto. The hotel is not deluxe category but is comfortable and offers all necessary amenities including a restaurant. Our guide picks you up at 07:30 am with the 4x4 vehicle. Arrival at the Pouso Alto ranch is estimated around 01:30 pm. A warm welcome is offered from Fernando Barros, the friendly owner of the Fazenda and your host. After lunch, relax in a gently swinging hammock under the shadowy porch or, if you prefer, in your air conditioned room. Later the afternoon, during short ride through the vicinity of the ranch, you can check out your trail horse and get a first impression of the wildlife around you. You will find the Pantaneiro horses wonderful, suitable even for the less experienced riders. The horses are all well trained, surefooted, calm and yet forward going. The saddles are made for comfort and safety. Back at the guesthouse, you may want to inspect other facilities and surroundings of the ranch. In the meantime, Anna, the cook has prepared the dinner and you are welcome to enjoy her local delicacies. Finish the day on the terrace listening to the sound of the night animals. Note: there is also the possibility to take a private air air charter flight into the Pantanal wilderness. The panoramic flight to our Fazenda Pouso Alto takes about 60 minutes and offers spectacular views from the low flying plane. Please ask for details. The day starts with a Pantaneiro farmers breakfast that makes you thinking you enjoying lunch instead. In the meantime horses are saddled and ready to go. 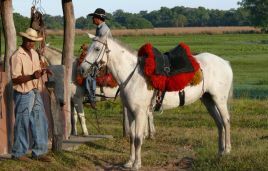 Today the group rides out with the peões, the cowboys of the Pantanal. The idea is to round up and tend calves at the outposts of the property. Return to Pouso Alto for lunch. After an appropriate siesta, the group gets on the horses again to explore the vastness of the Pouso Alto property. 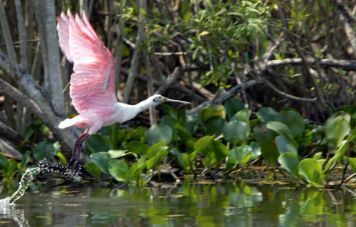 There is a great variety of preserved wildlife to be watched. 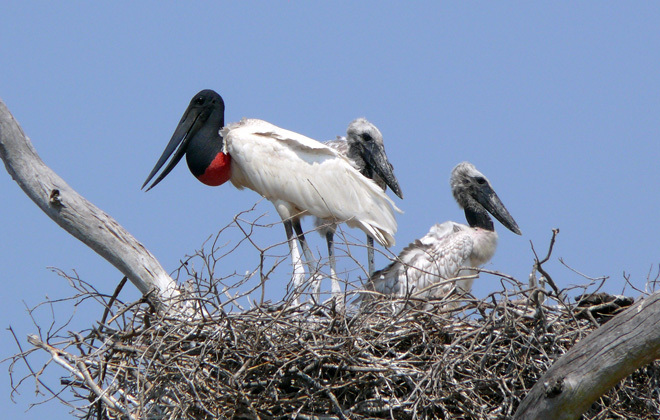 The birdlife is extraordinary, but also many other animals have made the region their habitat (please ask for a wildlife list when making reservations). Your guide will try to take you to the bands of black and brown howler monkeys that live in the area. Return during sundown. Dinner and overnight. Total riding time 6-7 hs. Early weak up, a quick coffee and off we are to a nearby pond where hundreds of herons start their day picking fish for breakfast. The approach needs to be careful as the birds will fly off at the slightest movement. But, no worry, they land and take off again in an endless movement, presenting thus a beautiful spectacle. Return for breakfast. Today the group will be riding a circle around parts of the property and watch and photograph as much wildlife as there is. 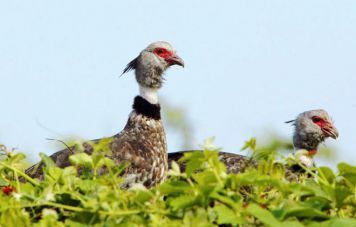 The American rhea, several species of birds of prey, nine banded armadillos, macaws, anteaters, the huge marsh deer, they are all there. Today´s schedule has been discussed with Fernando and the foreman of the ranch The idea is to ride out with the cowboys for another day of cattle work. It would be a full day on the range. A saddle bag picnic and a teréré Mate tea restore the energy. The schedule is flexible however, so that the group can always ride off for other discoveries on the property. At sundown the jeep is ready for a night safari when we will look out for the sleeping places of hundreds of white herons. We will also take our eyes and ears open for night active animals. Back at the ranch a lamb is roasting on the open barbecue. Fernando´s family mostly joins in for the good by dinner with his guests. Caipirinhas are being served and a lot of story telling begins around the fireplace. Don't get tricked by the open bar tonight as there is an early departure on the schedule next day. A hearty breakfast will prepare you for a tough riding day. We say good-bye to Fernando and his crew, with whom we had some really great days. Leaving before sunrise, our destination is the Nhecolândia ranch, some 40 kms ahead The guide will set a swift pace to cover most of the distance, taking advantage from the early morning hours when the horses are fresh and the air is cool. The ride along the Vazante Castelo and Mangabal takes roughly 6-7 hours. Vazantes are areas with retained water from the last rains. These areas feature lush vegetation and plenty of wildlife. Half way, next break is for saddlebag lunch on the banks of a little lake where trees provide refreshing shadow. Fruits, homemade breads, dry meat mixed with roasted flour of the manioc root, help to restore energy. This is also the place where new horses from Nhecolândia Ranch will be supplied, while the other are being returned to Pouso Alto. Nhecolândia will be reached in the early afternoon where the group is greeted by the hosts Doio and Rita, the owners of Nhecolândia ranch. Riders will appreciate a refreshing shower and relax after the long ride. They meet later on the terrace for drinks, followed by dinner and overnight. The Nhecolândia ranch features comfortable accommodations in a charming atmosphere. The meals are absolutely delicious and are taken together with our hosts. Dinner and overnight. The traditional Fazenda Nhecolândia is a property that encompasses some 16 thousand hectares and about 10,000 Nelore cattle, an Indian Brahma cross, perfectly adapted to the seasonal variable hot and humid climate of the Pantanal and other tropical and sub-tropical regions In Brazil. 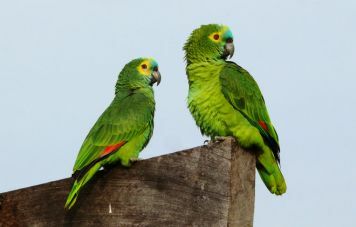 The Fazenda is located at the edge of the Vazante Castelo, hosting a great variety of wildlife which can easily be observed on the wide stretching and flat savannah bushland. During the stay here the group will be riding every day to different locations for observation of wildlife. Nature will release step by step its wonders, offering fascinating sights. The Nhecolândia region offers great riding at all paces on the wide land. "All meals were highlighted by local cuisine, the most delicious meat I have ever tasted, home- made breads, beignets and rolls, exotic fruits and vegetables, home- made cheeses, compotes, and cane fudge and caramel sauces. 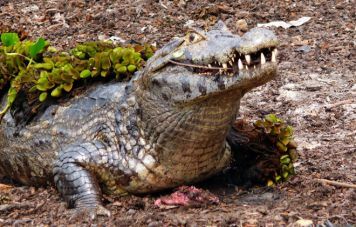 During our trip we were treated to fresh piranha, caiman, suckling pig, a BBQ of the hump of the Asian cow, and many other delicacies local to the country and the Pantanal". There is time in late afternoon for a relaxing canoe ride and piranha fishing in a nearby lake. We also recommend having a round of teréré mate tea with the peões. 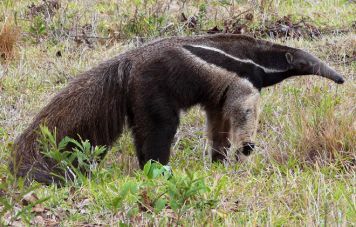 The peões, mostly descendants from Indigenous people of several tribes of the region encompassing Paraguay and Brazil, are the authentic representatives of the Pantanal. By chatting with them you get to know peculiarities and histories of which this region is well served. After another generous breakfast you are prepared for whatever comes your way today. The activities today include a ride on the property in the morning and on 4x4 driven vehicle photo safari in the afternoon. 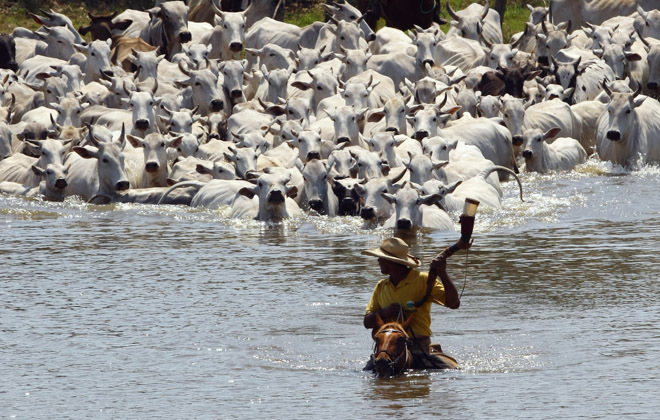 As an option we can ride out with the peões again to help with their cattle work. They have always something to take care of with such a big herd. The wildlife on this property includes enormous flocks of water birds, like pink spoonbills, several species of herons, jabiru giant stork, here also referred to as tuyuyu, jacanas because of his color referred to as cafézinho, all 3 big macaws, including the hyacinth macaw, the biggest of all, toucans right at the porch, peccari, giant and lesser ant eaters, marsh deer, capybaras, nine-banded armadillo, among others. Since this will be last night at Nhecolândia ranch, a special dinner might consist of generous chunks of roasted wild boar or lamb, either one washed down adequately with some good Brazilian wines (You certainly did not know that Brazil produces wine at all?) on the house. Today the group will depart early again for a full day of riding fun. The São Luis camp site is the destination. Riding for miles and miles at the edge of the beautiful Vazante Castelo one cannot help but to marvel at the wide open spaces covered with spots of lush native forest. Observe the animals on route or enjoy your horse for a great canter on these lands blessed by nature. Lunch is being delivered by the 4x4 support vehicle which also carries your belongings to the camp site. We have chosen a shadowy place for lunch followed by a much welcomed siesta, as the riding day is a long one. Night break is at the São Luis camp site. The camp is nicely structured with bathrooms, showers, kitchen, refrigerators, ventilators, window screens and servants. After refreshing drinks, cold beers and a good meal the group hits their hammocks. Some might prefer however to stay awake for some storytelling around the fireplace. Certainly the not so elusive but dangerous jaguar, the gigantic anacondas and brave horsemen are the subject. From the nearby lake you will hear caymans making terrifying sounds while hunting fish. Today is the fare well day. Enjoy your last Pantaneiro breakfast and off you are direction home. The surface transfer is coordinated according to the flight departures from Campo Grande airport but is generally set for right after breakfast. The 4x4 vehicle drive takes around 6-7 hours. This is the end of our Pantanal Wildlife Ride and Safari. Please ask for itineraries of our 12 days extended Pantanal trail and other interesting extensions as beach riding, whale watching, botanical discoveries, Amazon river tours and jungle expeditions. The Pantaneiro Horse has been developed as a cattle horse during the last 200 years in the state of Mato Grosso, the Northern Pantanal, to serve on the large farms which, not rare, measured some 150-200 thousand acres. The Pantaneiro or Poconé horses resemble the Crioulo horse from the Southern Brazilian pampas, showing a bit higher members, though. 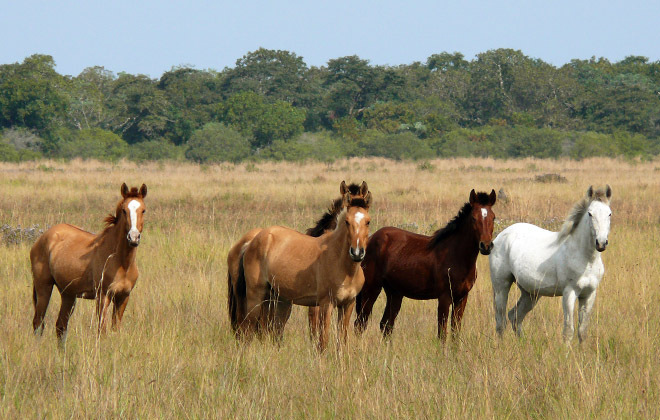 It has adapted through natural selection to the temporary flooded terrain of the Pantanal feeds even with the pasture under water and does not develop hoof diseases. The horses used by the peões (cowboys) to work the extremely agile Nelore cattle, are very alert and enduring even under heavy work load, when temperatures may reach 40º C and more. We offer those horses to the better qualified riders of the group. Handling and tack of the horses is similar to the western style. Saddles are lighter and covered by 2-3 colorful sheepskin layers for long days riding.